Discover the benefits of investing in ornamental fencing! There are many choices for residential fencing that will serve your desire for function and style. Your choice of fencing makes a large difference in the overall look and style of the exterior of your home or commercial property. They are often more of an investment than other fencing options, but you’ll find that investment to be worth it for all that you gain. Take that style up a notch with the elegance of an ornamental fence. If you need more convincing, here are three reasons to invest in ornamental fencing. Be careful not to reduce the function of ornamental fencing to their beauty. Most are made from durable and reliable materials that will turn your property into a fortress. The strength of the materials alone acts as a deterrent to trespassers and vandals. They are usually constructed using high-quality aluminum or steel and are resistant to degradation from various environmental factors. Plus, if a burglar ever tried to access your property, they’d find great difficulty trying to climb the fence or cut through it. Choosing an ornamental fence isn’t just a matter of picking options from a catalog. Although that’s a great place to start to gather ideas, you can use your imagination to create a look that is truly unique to your property. Many reputable fencing companies allow you to customize your fence in the best way to highlight your landscape and the architecture of your home. The options will often include choosing the general style, fittings, post caps, and door options. Ornamental fencing even works well on sloped properties. If you are an environmentally conscious homeowner, then you’ll gain the added peace of mind knowing that your ornamental fence is completely recyclable. When investing in an ornamental fence, you’re investing in a product that uses materials that have many uses and lives. The aluminum or steel can be repurposed many times over for use as just about anything, for several industries. With ornamental fencing, you won’t be contributing any waste to the planet. To get more tips on lawn care, and to top off your gorgeous lawn with a beautiful fence, Hercules Fence is ready to help you get the look and function you desire. 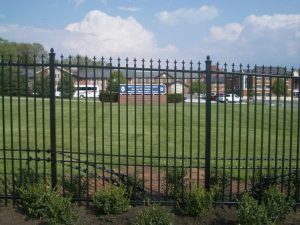 Hercules Fence has extensive experience in repairing and constructing fences made out of any and every material. Our experienced team can help meet your fencing needs, whether they’re residential or commercial, for the right price. Give us a call at 757-316-3600 or visit us online. To see examples of our work and keep in touch, don’t forget to follow us on Facebook, Twitter, Google+, LinkedIn, Flickr, and Pinterest. This entry was posted on Monday, July 16th, 2018 at 12:19 pm. Both comments and pings are currently closed.